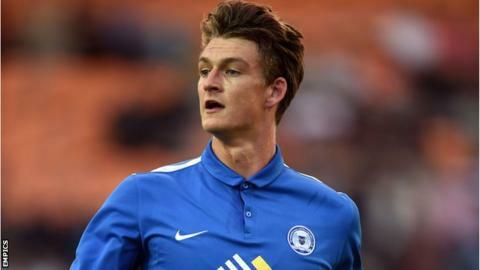 New Peterborough United signing Andrew Fox says the League One side will be a "step up" from playing in the USA. The 22-year-old, who has been playing at left-back during pre-season, has returned to England after four years studying at a Texas university. His move to Posh is his first experience at a professional club. "The quality of play is certainly a step up from what I've been used to but I've just been loving it," Fox told BBC Radio Cambridgeshire. "I'm thrilled to be here and to be back local - just coming in and seeing how the lads handle themselves, and the training sessions." Fox worked with a scouting agency to get his scholarship in the United States, where he was able to combine his sports science degree with a place in the university team. During that time, he played as a right-winger. "It's a little bit of a transition and I'm still on a learning curve," added Fox. "But I've really been enjoying the left-back position and trying to learn as quickly as possible." Fox signed for Peterborough on Monday, along with Kieran Sadlier, Souleymane Coulibaly and former Luton striker Lee Angol. "I had a contact that had a close friend very involved with the club, so that came about out of the blue," he added. "From that, I just tried as hard as I could to get an opportunity and it all came from there really."